I'm in the process of rebuilding my '87 Carrera 3.2L, and got a new 997 GT3 crank and oil pump (from William Knight), new 997 GT3 3.8L Pankl Ti pistons (130mm), 997 GT3 Cup intermediate shaft (slightly used), and 102mm P/C set from LNE. The pistons are custom made for the longer crank and rods. I'm changing the rod bolts to stronger ARP bolts, due to heavier pistons than the GT3. I got a set of "crazy" cams from Elgin, with 325 degrees inlet and 318 degrees exhaust with high (cant remember on top of my head) lift. My worry is that there might be a too tight clearance between pistons and valves... My engine builder did the math, and figured out it should be OK. However, he wants to assemble the engine and measure the valve to piston gap (and compression), and then machine out bigger valve pockets if necessary. However, if the pistons and valves collide, and there is not enough material in the pistons to be machined, would it be possible to put spacer rings on the cylinders (on the case side or the head side) to increase the gap? Piston crowns are generally thick and machining a shallow valve relief pocket should not be a problem. The relief is not that much. The majority of the material removed is at the bottom of the radius. I wonder how much it might lower the compression ratio machining out the pistons like that? Fly, that sounds like it's gonna be a pretty big engine for a 3.2 case! Keep us in the loop on how it turns out. Last edited by Canada Kev; 05-21-2016 at 07:01 PM..
Something else to consider is the 3.0/3.2 crank pulley in stock form is not compatible with the GT3 crank. The setup requires a custom made crank pulley for proper alignment plus a different pulley bolt. I've also not seen it mentioned anywhere...but there are several different styles of flywheels and pilot bearings depending which engine and year you start with. It seems the 78-79 3.0L w/915 trans and 87-89 3.2L w/G50 trans both use flywheels with press-in pilot bearings. I would expect these may work the same as original when used with a GT3 crank. The 80-86 3.0/3.2 w/915 trans on the other hand uses a flywheel where the center is clearanced for a flanged pilot bearing. The pilot bearing bolts directly to the crank with (3) small socket cap screws. The GT3 crank does not have the threaded holes for attaching the pilot bearing in this case. if you wanted to re-use the flywheel on 80-86 models I expect you could just have the (3) threaded holes added. Any reason not to do it this way and just add the threaded holes similar to original....? Clewitt will make you you pulley, I also ran the Elgin cam 324,318 and I believe it was at 106 L/C you will need to measure the dome thickness as it is common practice to make the domes as thin as possible. I think I needed to cut .040 or 1mm out of the inlet pocket to get min Piston to Valve clearance and I think that number turned out to be 1.25 mm of clearance I believe the total lift of that cam to be 13mm. It runs pretty quick you will be pleased. Invaluable input here chaps. First stage complete - 997gt3 crank (99610202196) has arrived at the engine builders, and rods are on order. racing97 - would you mind sharing what kind of peak hp RPM can be expected from an engine like you mention above with the Elgin 324 grind on a 3.8L or similar sized motor? Thank you. The Engine in the data was 3.4 ltr and made 347 hp at 8,000 it was for all intents and purposes is a slide valve RSR the 3.8's I have had experience with were Factory rsr's with Plenium and the best made 380 with various modifications but essentially a different cam then Elgin. more details, i am doing ground work on this also, prepping for winter project. Many builds use a GT3 oil pump along with the GT3 crank upgrade. There is some minor clearancing to fit the oil pump to the 3.0/3.2 case which is not a big deal. 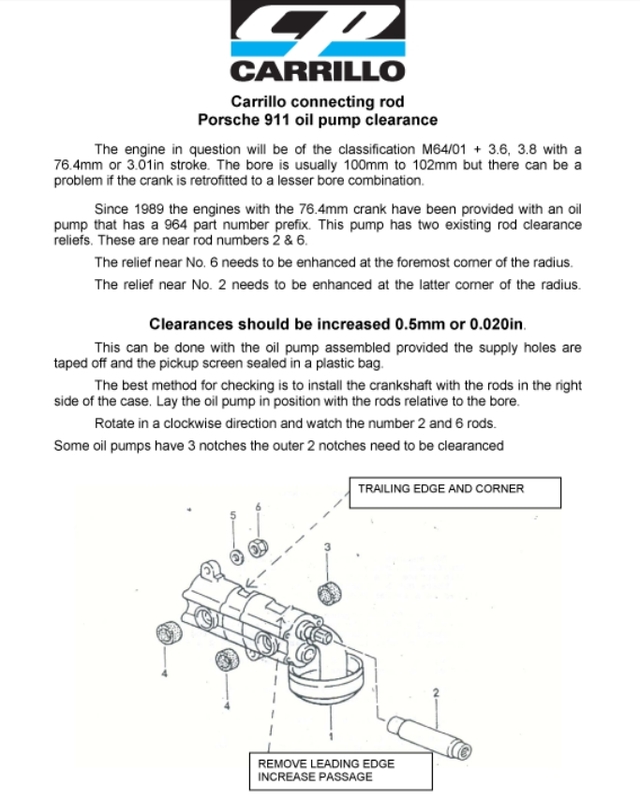 What I was wondering though...are there issues with clearance between the oil pump and connecting rods depending which rod type or rod length is used? For example, if you used a stock 127.8mm SC rod is there a rod/oil pump clearance issue? If stock rods have clearance issues, can it be solved by using after market Pauter rods? I just did this test fit to a 3.0 case and the 76.4 GT3 crank. I put the stock 3.0/3.2 oil pump in and installed a set of stock 3.0 rods. #3 & #6 hit the oil pump. Then I installed a 930 Turbo oil pump. #3, #6, and #2 hit the pump. #2 & #6 would need alot of clearance mods to the 930 oil pump. With some better rods and a little clearance work this should work fine. Pump clearance is a known issue with aftermarket rods and with original Porsche rods as Mark has indicated. I think this is one of the reasons Carillo, Pauter, R&R reverses the location of their rod bolts? These rods have the bolt threading into the rod cap and therefore they don't have nuts with the bolts. You can see in the above link that the pump is already clearanced (notice the "dents" where the machining was done) when manufactured and it needs to be clearanced even a little bit more for the aftermarket rods. Good info KTL - I'm *hoping* I already have a gt3 pump fitted but won't know for certain until the cases are split. Rockers are stuffed - these were refurbished items, however blocked spray bars have taken their toll. Lots of excess sealant visible in the pics, linked? Standard 3.2 oil pump fitted, new gt3 pump procured. William Knights cams have turned up, he's asked me not to share specs. Staying with SSIs until I find a solution with heat. WK has no time for the 993 heat exchangers, the newly marketed Eisenmann SSI copies may be an option. Have you identified what pistons you have there? The flat top looks like a low compression piston for a turbo engine. Have you determined what rod length and type you will be using for this build? Also which pistons and pin height?